Among the many recipes that I had left aside so far, because everyone knows how to prepare it, there is that of sponge cake. A kitchen classic, even at home, and the basis for many other sweets. Of the two ways to prepare it I prefer the most classic preparation, that of Genoese pasta. The privilege because it gives me the impression, compared to the final addition of the egg whites mounted on snow, to always guarantee the final result. Then everyone can choose the method he prefers and, if he does not trust himself, add yeast as well! The fundamental ingredient, besides the freshness of the ingredients, is the patience and the necessary time. the procedure requires a few steps, although not very short. I for the cake of cm 18 Ø I use three eggs and for that of cm 22 Ø four. Grease a cake tin, sprinkle with breadcrumbs and keep aside, preferably in a cool place to prevent the butter from bleeding! Preheat the oven, static, to 180 °. Place in a saucepan and add the sugar, breaking them one by one separately, the whole eggs. It promotes the stabilization of the dough and dampens the egg aftertaste. when the temperature will be slightly warmer than your finger (that of a person with a high fever ...) the dough will be ready to be mounted. (and this is the reason why many prefer the technique of egg whites added at the end ...). the temperature rises much more slowly and it is easier to judge when the ideal temperature has been reached. Without stopping to mix, pour the mixture into the mixer turned on at the minimum and gradually increase the speed of the whips up to the maximum. It takes fifteen minutes for the dough to be perfectly assembled: and it takes everyone. So put your mind in peace and while the fuste work the other ingredients are prepared. Add vanilla (optional) to the flour (or the mixture of flour and starch - v. Note) And sieve it at least two times on a sheet of paper. The eggs will be mounted when the volume will be at least tripled and, lifting the dough with a teaspoon, it will remain lifted without being reabsorbed immediately. Now you can add the flour: the canonical rule wants it to be incorporated gently with a spatula to the dough. I prefer to put the beaters at idle and slowly pour the flour. This operation has to last a short time, while using as gently as possible, to avoid disassembling the dough. any irregularities in the surface must be leveled with the spatula, never shaking the cake pan! Transfer gently into the oven and leave it closed without ever opening it until the end of cooking: they are necessary from 30 'to 45' depending on the amount of dough and the size of the cake pan. do not be scared, that's right. but as soon as it is cold it can be used as a base or complement to many other desserts, starting (in place of the usual ladyfingers) from a refined tiramisu! Flour: I prefer to lower the strength of the flour by replacing a third with an equal amount of cornstarch or potato starch. This basic dough lends itself to many variations: from the addition of butter (or seed oil) to the dough to the substitution of part of the flour with cocoa or almond flour. And the consistency of the dough itself can be changed by modifying in part the proportions between the three main ingredients. 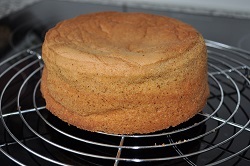 Wanting to flavor this cake as well as vanilla you can use lemon rind, always added to the flour. biscuit, Genoese pasta, bizcocho, sponge cake, pâte génoise. it takes more time to describe the preparation than to do it!